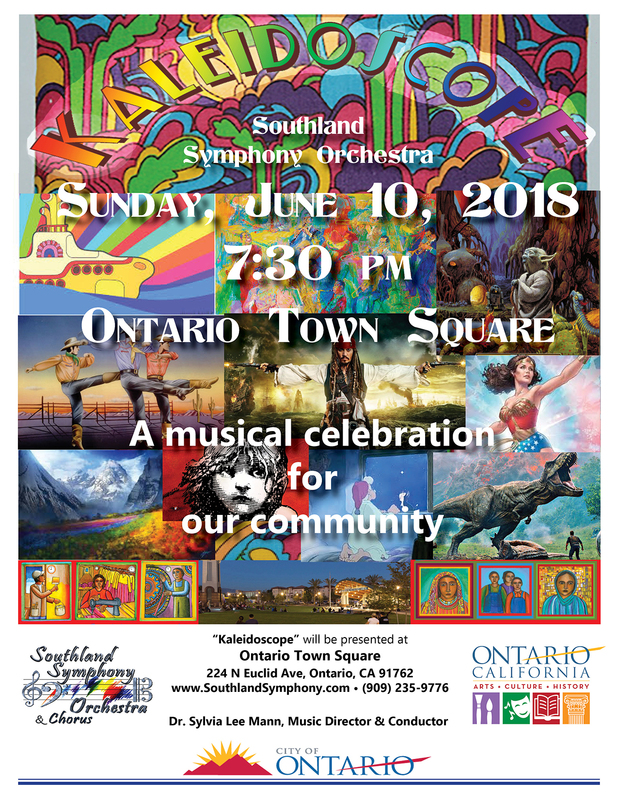 ONTARIO, Calif. — The Southland Symphony Orchestra is presenting another FREE concert! Come celebrate Our Community at SSO’s “Kaleidoscope” Concert – Sunday June 10th, 2017 at 7:30 pm. It’s FREE for the whole family at Ontario’s Town Square Amphitheater! Enjoy music of the Big Bands, The Best of the Beatles, and music from your favorite films – including Wonder Woman, Jurassic Park, Pirates of the Caribbean, Star Wars, Pinocchio, Les Mis and more. The orchestra will also be performing favorite American Classics like “Hoedown” from Rodeo (“Beef – it’s what’s for Dinner!”), The Stars and Stripes Forever, The Star-Spangled Banner, and Dr. Mann’s popular “Heritage Suite” – a collection of folk songs from all around the world – celebrating our diverse community! and much more…. Vocal soloists Coril Prochnow and Abrenda Davis will be joining the orchestra for this event. Both are well known musical artists, with wide ranging repertoire. They are principal singers with the Repertory Opera Company, the Southland Symphony Orchestra Chorus, and the Los Angeles Camerata, among others. Discover YOUR Orchestra – Ontario’s Southland Symphony, soloists, and enjoy a chance to sing along! Bring your picnic blanket and cushions – plan to be comfy and have a great time! The Southland Symphony is a non-profit organization and needs your support to continue presenting these world-class quality concerts!